Starring Van Heflin, Barbara Stanwyck, Lizabeth Scott, Kirk Douglas, Judith Anderson, Roman Bohnen, Janis Wilson, Darryl Hickman. It’s no coincidence that the majority of the artistic elements assigned to film closely correspond to their literary cousins. This is in part because early film development was influenced by the literary genre. A genre is a way of categorizing an artistic creation (a film, book, music, etc.) by a set of repetitive elements. But just what *is* a film genre? A film genre contains certain elements that can be found in successive films of that category. The basic foundation of film genres – comedy, drama, science-fiction, horror, action, fantasy, mystery, and romance are all readily identifiable as separate and distinct “types”, or genres. These genres, in turn, also contain “sub-genres” – that is, certain films that can be further classified into unique subdivisions. Some of these offshoots are such a specialized genre form, that they go on to defy the sub-genre label. American film noir, which began (more or less) in the 1940s, contains a special philosophy all of its own, that is expressed vis-à-vis certain recognizable features. Nowhere is this more evident than in the noir masterpiece, The Strange Love of Martha Ivers (1946). • The main character is a hero by chance and never willingly. 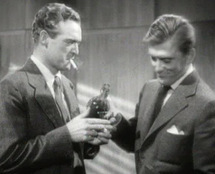 Sam Masterson, (played by Van Heflin) is a happy-go-lucky kind of guy, with a few quirky secrets that always keeps him on the wrong side of the law. • Our Hero is usually in conflict with another male that he has some connection to - by friendship, ideology, lifestyle, or familial ties. Sam find himself back in his Pennsylvania home town of Iverstown, and decides to look up an old friend, Walter O'Neil, (Kirk Douglas, in his screen debut) now a successful District Attorney. • The Hero is attracted to a deadly female – a Spider Woman – if you will. This woman is independent, strong-willed, cunning and ruthless, qualities that the main character/hero feels unable to communicate. Martha Ivers, (portrayed by Barbara Stanwyck, in a wicked performance) is Walter's bored and jaded wife, a successful CEO and the town's leading citizen. Sam's arrival ignites Martha's smoldering feelings and she sees a neat way to dump Walter and to at last enjoy the love of her life. • There may or may not be another female, who our Hero likes – and exhibits qualities that are in direct opposition to the Spider Woman. She’s is loyal, brave, kind, compassionate, and understanding. Toni Marachek (Lizabeth Scott) is such a woman, recently paroled from prison, who's spunky hypersensitivity is contrasted by her codependent longings for Sam. • In terms of plot, there is always a crime lurking somewhere: Either one that has been committed and hushed up (the Secret) and/or another crime that acts as a temptation for the Hero (to make the Choice). Martha and Walter's past crime of murdering her rich, abusive aunt (Judith Anderson) condemns them to a toxic marriage, where Walter drinks to forget and Martha cheats to isolate. Thinking that Sam's return signals a life of blackmail and possible exposure, Martha alternately goads both men into a convoluted cat-and-mouse game as the clock winds down. • There is always a sense of dread, fear, and underlying sorrow that the eventual outcome may not be what the Hero wants to choose. Sam cares for Toni and the promise of a new beginning with her, but at the same time he's attracted to the lure of Martha's nostalgia. The Hero must make his Choice is between good and evil, preceded by an intense personal struggle. Allowing himself to be seduced by Martha, their passionate interlude causes a rift with Toni, who prepares to leave town, carrying her wounded pride tucked carefully in her shabby suitcase. Not to be outdone, Martha has planned a happy ending of her own. Each film noir ends differently, so the climax and eventual conclusion of The Strange Love of Martha Ivers is best left to the viewer's experience. The musical treatment sets the tone by highlighting the emotional conflicts that the Hero is experiencing, usually moody and dramatic in all the right places. Composer Miklos Rozsa was no stranger to film noir, as his credits include such noir classics as Double Indemnity, The Killers, and The Asphalt Jungle. • Cinematography is central to emphasizing this mood, expressed through a strong interplay of juxtaposed elements of light and dark, intense shadows, extreme close-ups and patterns. This film marks Victor Milner's only solo noir venture, yet he highlights subject and setting, costume and actionskillfully, with memorable results. Settings contrast between the grim and elegant, as those wedded to evil are usually shown in luxurious surroundings. The genre of American film noir (meaning black novel) began to foreshadow the complex feelings of the post-WWII American male and what he was experiencing from the changing world around him. Women were now more independent and wanted to express that in the post-war era, much to the dismay of their returning husbands, lovers, and the world at large. The harsh realities of war forged a new cynicism that would reach full flower during the Vietnam experience. Yet the cinematic translation gave us some of the most unforgettable films, iconic characters, and compelling stories that continue to fascinate and thrill us. The photos are from one of the classic greats of film noir, "The Strange Love of Martha Ivers", 1946.